Bench Planned Parenthood’s Hilary Rosen as CNN Contributor! Washington, D.C. – Penny Nance, CEO and President of Concerned Women for America, today sent a letter to CNN President Jeff Zucker requesting the removal of CNN political contributor Hil ary Rosen from TV appearances due to her new position as crisis communications consultant to Planned Parenthood. The mission to suppress video from the news media that shows Planned Parenthood officials and employees negotiating the sale of the remains of aborted babies creates a gross conflict of interest, said the top official of the nation’s largest public policy women’s organization. “I am writing to respectfully request that CNN immediately cease appearances by Hilary Rosen as a political contributor. Since she has been hired by Planned Parenthood to handle the crisis that has resulted from the extremely newsworthy video footage of Planned Parenthood employees and officials negotiating the sale of the remains of aborted babies, there is clearly a conflict of interests. “The dual role of working for a major news organization while also being paid to minimize the most impactful news story regarding the issue of abortion in recent memory is unacceptable, particularly as the questions surrounding Planned Parenthood, which receives more than a half-billion dollars annually from taxpayers, are playing a role in the presidential campaigns of both political parties. In the spirit of an open and free press, fairness in news coverage, and credibility with viewers, CNN and Time Warner need to cut ties with Ms. Rosen and her firm SKDKnickerbocker while she and her firm are being paid by Planned Parenthood. In addition, any unpaid CNN appearances by Ms. Rosen or her employees at SKDKnickerbocker discussing Planned Parenthood should be clearly identified as representing Planned Parenthood. 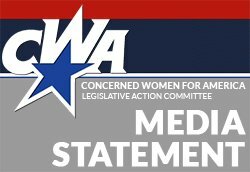 For additional information and to schedule interviews with Penny Nance, contact Janae Stracke at (712) 269-1724 or jstracke@cwfa.org, or Cheri Jacobus of Capitol Strategies PR at (202) 257-4638 or cherijacobus@aol.com. NOTE: Penny Nance will be in Cleveland, Ohio, on-site at the Republican presidential primary debate, Thursday, August 6th at the Quicken Loans Arena and will be available for interviews and to offer commentary and analysis.